This image covers a portion of the central uplift of the 120 kilometer diameter Oudemans Crater. Oudemans is located at the western end of Valles Marineris and just south of the great canyon system by the Noctis Labyrinthus. Images from the Mars Orbital Camera (MOC) were the first to reveal that this large impact crater exposed layered rock in its central uplift feature. Such beautifully preserved layered rocks, although rare, are no surprise to planetary scientists. First, layered rocks exposed in the central uplifts are common in terrestrial impact structures. Secondly, there is abundant layering exposed in the nearby Valles Marineris canyon system — a gash that exposes layering down to 7 kilometers beneath the mean surface. This suggests that layered materials exist to great depths in the subsurface, which is supported by the Oudemans central uplift observation. Based on estimates of the depth of excavation for a crater the size of Oudemans, these layers originated from just as deep as those exposed in Valles Marineris and possibly deeper. A comparison of the layers in Valles Marineris and in the Oudemans central uplift may prove that they are similar rock types that share the same mode of origin. 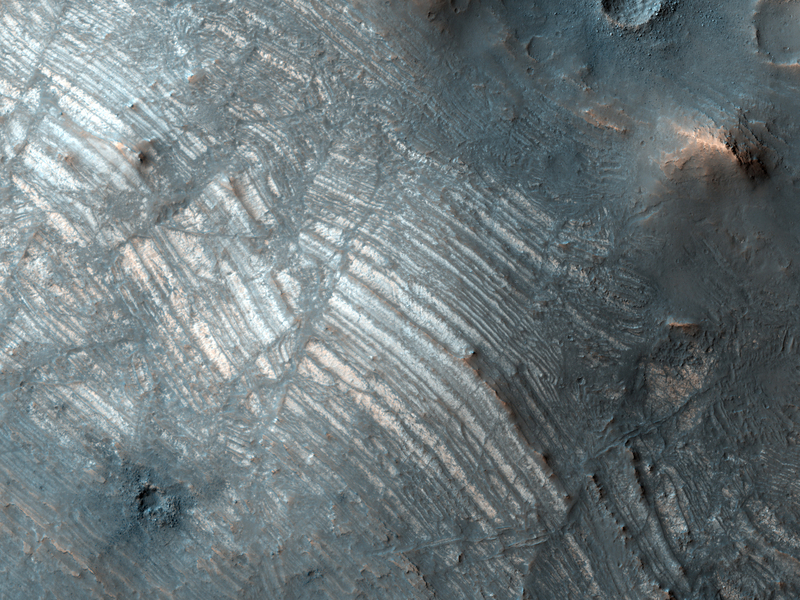 The fact that these layers are so well intact gives planetary scientists specific clues regarding the subsurface and history of the general area. Additionally, three other craters, Martin (21.2 degrees south, 290.7 degree east), Mazamba (27.3 degrees South, 290.2 degrees east) and a yet unnamed crater (28.4 degrees south, 305 degrees east) also possess finely layered materials in their central uplift features and lie within the circum-Tharsis region. The preservation of the layering and geographical occurrence of these four craters suggests that they could be ash layers deposited from numerous episodes from the Tharsis volcanoes. Voluminous volcanic episodes could have produced large volumes of layered rock that could have been rapidly buried and protected from cratering. This is a stereo pair with PSP_002446_1700.